Shandur is situated at an altitude of 12,500 feet (38000 meters) above sea level is famous for having the highest polo ground of world. It is also at times called Roof of the World. The version of polo game played in Shandur Polo Ground is the purist of all. It is also called free style polo. The beautiful polo ground of Shandur turns into a city of tents each year in July due to Shandur Polo Festival. 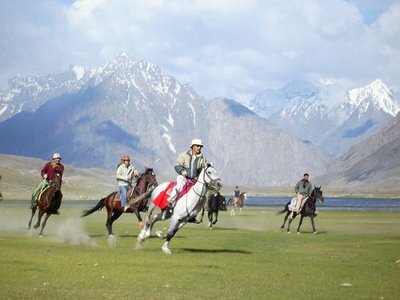 A match of polo is held between teams of Gilgit and Chitral. A great number of tourists and spectators from different areas of country and the world come to attend this event.